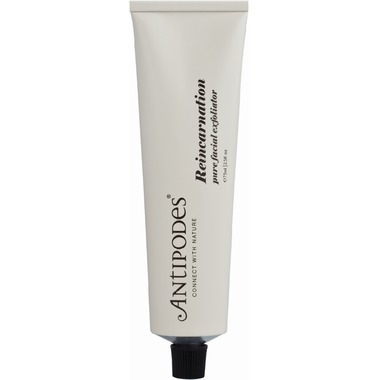 Antipodes Reincarnation Pure Facial Exfoliator is a beautifully effective yet gentle facial exfoliator. Avocado oil and jojoba beads marry to lift away lifeless skin, while calendula oil works to nurture and repair. Avocado oil and jojoba beads marry to lift away lifeless skin, while calendula oil works to nurture and repair. Your skin’s surface is cleared and revitalized by carrot deed extract, and essential oils of cedarwood & sweet orange calm and balance its appearance. Key Ingredients: Calendula oil heals and nurtures, jojoba beads and carrot seed extract clear and revitalize, essences of cedarwood, sweet orange calm and balance skin’s appearance. How to Use: Gently blend into moist skin at sunrise or whenever our skin calls for a new life. Rinse well with warm and pure water. Great facial cleanser, does not really seem to be an exfoliator. Wonderful scent and leaves skin moisturized and soft. This was a product I received as a sample. I have to say it is something I will probably buy when I run out. It is so gentle on my skin and leaves it feeling very soft and clean. I find it leaves a residue so I only use it before bed. Nice scent. Gentle exfoliate.